OpenVPN is a popular open-source VPN (Virtual Private Network) software application to create secure point-to-point or site-to-site connections in routed or bridged configurations and remote access facilities. OpenVPN uses a custom security protocol that utilizes SSL/TLS for key exchange, and is capable of traversing network address translators (NATs) and firewalls. In order to connect to a VPN server based on OpenVPN, users normally use the OpenVPN Client. OpenVPN no longer provides a standalone OpenVPN Client (openvpn-client.msi) for Windows desktop operating systems. In order to install the OpenVPN Desktop Client to load the .ovpn file, you need to download the all-in-one OpenVPN GUI setup installer. Start the OpenVPN setup installer. Follow the OpenVPN installation wizard and accept the license agreement. 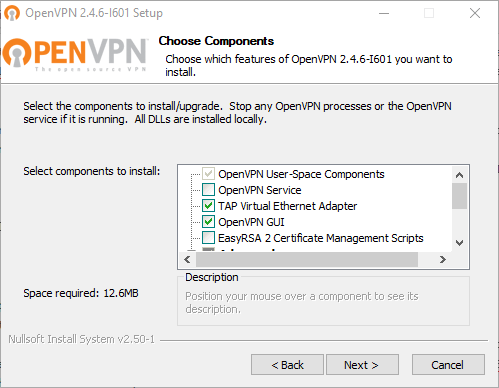 When asked to choose the components and features of OpenVPN to install, make sure that TAP Virtual Eth Adapter and OpenVPN GUI are selected. You can deselect other options such as “OpenVPN Service” and “EasyRSA 2 Certificate Management Scripts”, which are unnecessary. If you’re prompted by a Windows Security dialog pop-up asking to install the Desktop Clients TAP Adapter in the name of “TAP-Win32 Provider OAS Network adapters”, check the box that says Always trust software from “OpenVPN Technologies, Inc.” and click Install. Complete the wizard to install OpenVPN GUI. The desktop client OpenVPN GUI is now installed on the Windows system. If you have a .ovpn file to connect to a remote OpenVPN server, you can now run the OpenVPN GUI (which automatically minimize to system tray / notification area). Right click on the OpenVPN GUI icon, and select Import file… option to choose the OpenVPN config file. Once the OpenVPN VPN connection configuration is important, right click on the OpenVPN GUI icon again, and select the Connect option.